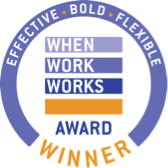 Since 2011, we have brought the When Work Works Award to Oregon. Why? Because we know that creating a family-forward workplace takes courage and leadership. We also believe in highlighting things that work – it inspires others and rewards innovators. *Note: There was no award nationally or in Oregon in 2015. Congratulations and THANK YOU to all of these forward-thinking employers in Oregon!